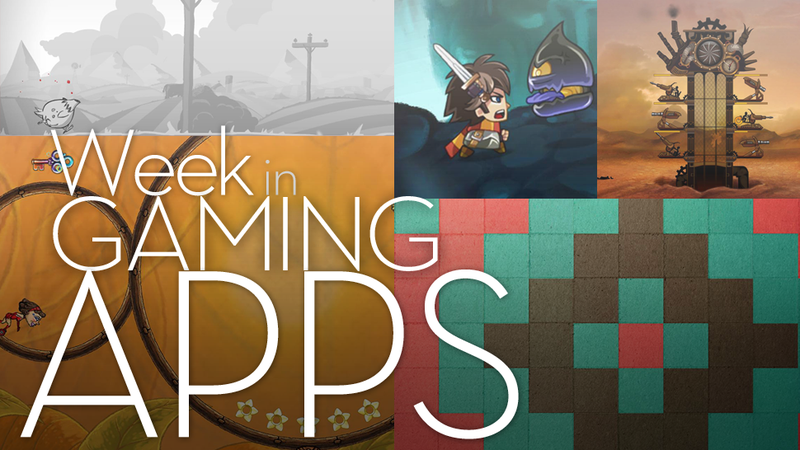 Since we can't all go back to bed, let's play some gaming apps instead. Here are eight of the latest and/or greatest to get us started. Well, get you started at least. I've already played these, and once I post them I have to actively pay attention to whatever my co-workers are talking about. Grand Theft Auto V or Pokemon or something. Sometimes, when no one else is looking, I sit at my desk daydreaming about being an accountant or working a tech support hotline. Accept a quests, complete a quest, accept the next — this is the essence of quest-based role-playing games as a 2D side-scrolling runner. Rather keen. 48 levels of running, jumping and flying via powered bubble gum. You'd think this was a product tie-in, but no — just a clever game with an even more clever name. As much as I've grown to despise steampunk over the past few years, I can handle the golden browns of Steampunk Tower, as long as none of my old goth friends show up covered in khaki and gears. An endless-running tribute to Miracle Mike, the headless chicken who lived for 18 months after his head was chopped off. We should all be inspired by his story to live without heads or something. They call this a ringformer — a platformer where you roll inside and outside of a series of connected rings. It takes some getting used to, but it's very unique. Ah, the things we do for a unique app name. Harmony-ish is a nifty little game about arranging colored square in a pattern. This is a simple 3-color pattern. They go up to 10. Yikes. From the makers of Lume — well, that's all I really need to say. Okay, fine. This is a lovely little puzzle game in which players have to fold out colored paper to fill the screen. It's not all that easy, but it is just lovely, so you won't mind. I've never seen the movie Monsters Vs. Aliens, but I love a good rotation puzzle, and that's what this is right here. The're a blob cleaning up some stuff and there are obstacles and it's free and we all win the day. That's what we played last week. What did you play? Was it cool? Did you waste all of your monies? Tell us.